Tiore cottage is spacious, comfortable and family friendly. The view out the back is south facing and goes on for miles. 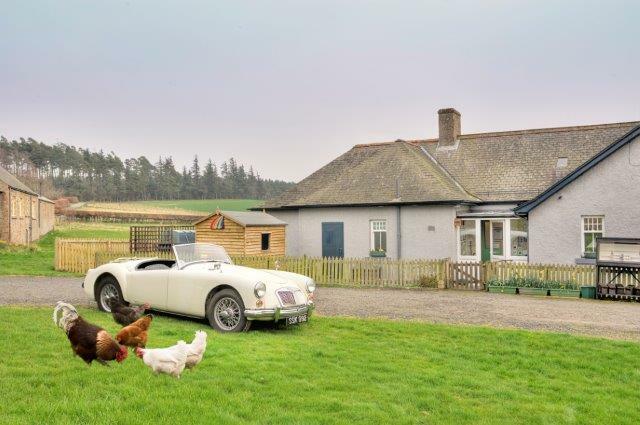 The cottage nestles below Bowmont Forest, with its many paths to explore, in a beautiful rural location of the spectacular Scottish Borders, 4 miles from the historic town of Kelso. The cottage was built in 1914 and has been tastefully refurbished to a high standard with double glazing and modern facilities. There is oil fired central heating throughout the cottage with back up electric heaters available. Hypoallergenic bedding is used on all beds. Bedroom one has a king sized bed. Bedroom two is a twin bedded room. Both look out to the south. A cot or child bed is available by prior request but please bring your own bedding for the cot. Also on request we can provide bed safety bars, a changing mat, high chair, portable safety gate and child step stool as well as other necessities. Bed linen, duvets, pillows and blankets are included in the price as are many thoughtful extras. The pristine white bathroom has a toilet, sink and good size bath with a hand held shower. Towels are provided. For your added convenience and comfort the separate shower room is of ample proportions. Non-slip mats are provided for your safety. The kitchen is fully equipped with a cooker, microwave, fridge/freezer, kettle, toaster, slow cooker, crockery, utensils and other essentials. Kitchen towels are included. There is ample space for comfortable dining. In the spacious lounge, with its south facing window and comfortable leather sofas, there is a television, radio, DVD, video and CD player. There is a selection of DVDs, videos, games, toys and books. The electric stove will add instant glow and/or warmth. Accessed from the porch, this ample sized laundry/drying room has a sink, washing machine, tumble dryer, iron and ironing board and clothes pulley. There is also an electric panel heater provided for drying damp or wet clothes when the central heating is not in use. There is a chair, coat rack and boot tray in the large entrance porch. The private south-facing garden is to the rear, secluded side of the property. There is a small raised area outside the kitchen door which becomes a suntrap in warmer weather where you can sit and watch the view whilst having your morning coffee or evening glass of wine. Garden furniture plus umbrella is provided for your relaxation. The picnic bench is great for alfresco meals. There is a storage shed for bicycles, golf clubs, fishing rods or other equipment. On the private road outside the front gate there is ample parking space. The beautiful view is free and ever changing with time, light and the season.